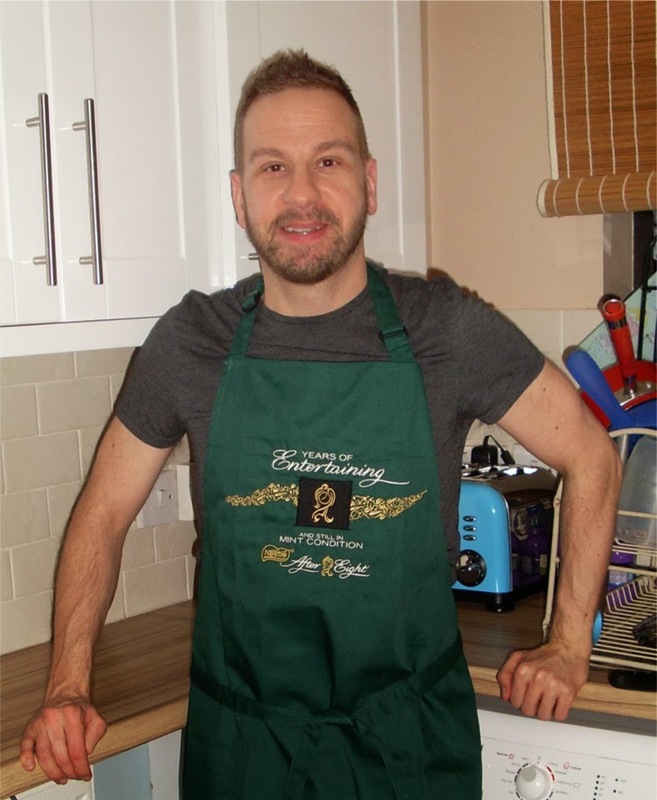 Cakeyboi: After Eight Goodies Giveaway! It’s After Eight week here on Cakeyboi and if you saw my recipe for Very Merry Minty Shortbread Squares, you will know that the nice people at After Eight HQ sent me a box of After Eight goodies. This included, a lovely After Eight Apron, a pen emblazoned with the After Eight logo and a box of After Eight Collection Chocolates. Well, as it’s the season of giving, these items could be yours! The pen is a ballpoint and writes in blue ink. 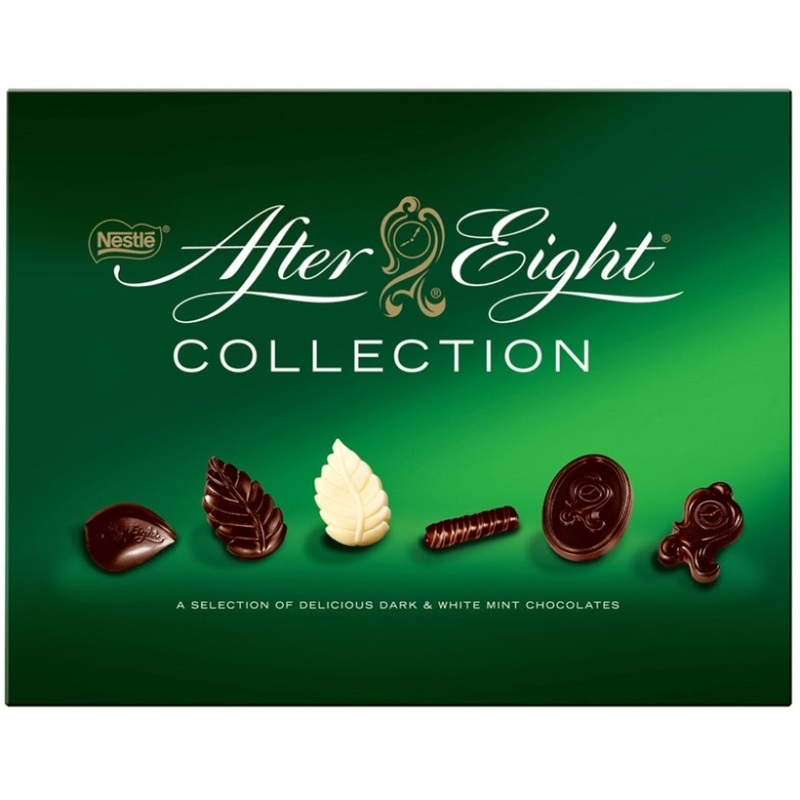 The (142g) After Eight Collection chocolate box has a selection of dark and white mint chocolates. Oh, and there are also 5 After Eight recipe cards as well! Entry is via the Rafflecopter thingamajig below. The giveaway is open until midnight on the 24th December and I will endeavour to let the winner know as soon as I can after that. Good luck! Disclosure Statement: I have not been paid to write this post or host the giveaway. I received the items free. Any opinions expressed are my own. I love chocolate and mint - classic combination and the squares are just perfect for after dinner. Because if you really want you can just have one ...but then again! Yum I love After Eights! After Eights are darkly divine! I've always loved After Eights mainly because I like anything with Dark Chocolate and mint. I love to let them melt in my mouth!! After Eights has delish sweets. love the flavors and the packages! A perfect wrap up to a Christmas meal! They are the classic after dinner mint. Love mint and love chocolate and they just taste great. I love the refreshing minty taste. it wouldn't be Christmas without after eights, they're a total classic! I mean come on you really can't have Christmas without After Eight can you? One of my fave chocolates - they are moorish and I cant stop !!!! I love the combination of the dark chocolate and smooth mint cream - they go lovely with a cup of freshly ground coffee. They always remind me of Christmas. because I can use the excuse 'that curry was spicy, I need an after eight to clean my palate' to eat lots of yummy chocolate!! I love them cos they are so delicious & cleanse your palate after a meal. Because they're great to nibble on and taste fantastic. perfect on a night in with some wine & the wife AND perfect on a night out after a curry with the lads too! I always used to be given an After Eight at Christmas time when I was a kid. I love them now as they remind me of those happy times. I just love the taste as I love dark Chocolate and love Mint. Trouble is I can eat the whole box the same day!! They are plain chocolate and minty and thin! After Eights contain chocolate, always a must, and mint, always a great combination, and they never categorically state After 8am or 8pm, which is one of those great loopholes that you can exploit without feeling guilty. As a child we were only allowed After Eights at Christmas so the taste fires off my memory. No other after dinner mints are quite the same. Love these but hate it when someone eats them all then puts the empty wrappers back in the box. There's so many in the box no one notices how many you've had! After eights, I will eat at any time.! ! They are thin so I can eat more and feel less guilty lol! They remind me of Christmas at my grandmother's house, when I was growing up. I just love after eights but wierd that I only buy them at christmas !! I love dark chocolate and mint, they are just amazing! Chocolate - no need for any further comment!! They are just delicious! They are so refreshing too! Because they are a taste sensation. And I love the little envelopes they come in! I love After Eights because there's nothing better than thinking the box is finished and full of empty wrappers then finding a chocolate in one of the envelopes you missed! They are my favourite binge comfort snack! Ever so light and moreish. Love them, it's that snap of dark chocolate and smoothness of the mint fondant - lovely! I love the combination of flavours. Theyre so retro, but always delicious! it's my godson that love them! He's addicted! I adore after eights, remember longing for them when I was a little child and being told that they were for grown-ups only! dark mint chocolate rocks! The dark chocolate embraces the peppermint fondant cream and goes down a treat when served with coffee at the end of a meal. Ilove it because of its unique composition mint and chcolate- yummy! Love how they melt in the mouth. A whole one or a nibble, both are great! Because mint and choc is one of the best combinations! I love the soft mint centre. They're delicious and great for sharing. Its just the perfect combo of mint and chocolate. I love mint chocolate and I also love how moreish they are - though I have to fight with my hubby for the last one in the box! Wonderful with a cup of coffee after a meal,the only thing is I can't stop eating them. it's the combination of that smooth, rich dark chocolate mixed with the dreamy mint cream center that does it for me every time! My absolutely favourite chocolate! But my pet hate is when people leave empty cases in the box! I love dark chocolate best and the centres are to die for - dont last long on ourt house! oh because they are divine! there is just something luxurious and very moreish about them. I love them because they are refreshing and satisfy my love of chocolate, classic flavour that no Christmas should be without. Mmmm, lovely chocs, especially sitting on top of a hot chocolate and slowly melting, total decadence. Because they're great to hand out to guests - I've never met anyone who doesn't like them! Because anyone that comes to our house, just loves them too! They are a classic Christmas treat that are just so moreish! I love After Eight's because they remind me of my Mum. The mint tastes really cool when you eat them. Mint and chocolate, what's not to like ? ?